iStock/Thinkstock(NEW YORK) — Former Major League Baseball (MLB) pitcher Ron Darling is out with a new book, 108 Stitches: Loose Threads, Ripping Yarns, and the Darndest Characters from My Time in the Game, in which he recalls some of his most memorable encounters and experiences as a ballplayer. Following public comments made by ex-teammate Lenny Dykstra in response to the book, however, Darling hopes fans will understand his intention behind writing it. Darling alleges that during the 1986 World Series, Dykstra hurled “racist” and “hurtful” comments at then-Red Sox pitcher Dennis Boyd, which Dykstra has vehemently denied. His aim was also to illustrate that “37 years ago, the atmosphere, the dugouts, and locker rooms at many times were awful places to be,” and this was just one example of it. A baseball television analyst and former pitcher whose MLB career spanned 13 seasons, Darling has spent most of his life involved in the game. With 108 Stitches, he hopes to honor his experiences by telling stories about “forty years of wonderful characters, people who have taught me a lot, and some unseemly things certainly that others and I have been involved in.”Copyright © 2019, ABC Radio. All rights reserved. Halfpoint/iStock(NEW YORK) — As health care re-emerges as a potential leading issue heading into the upcoming 2020 presidential election, a new poll shows that, for many Americans, it’s also a financial issue. According to a new national survey by Gallup and West Health, Americans borrowed $88 billion to pay for health care in the past 12 months. In a number of cases, the costs were so high that individuals chose to forgo medications or treatment. For example, the survey notes that 15 million Americans deferred purchasing prescription drugs due to the costs of the medications. Beyond that, there were 65 million adults who chose not to seek treatment for a medical issue because of the cost, according to the survey. The same concern reportedly emerged during times of crisis, with 41 percent of survey respondents saying that they decided not to receive care in an emergency department due to the costs in the past year. Overall, 77 percent of the people who responded to the Gallup-West Health survey said they were either “extremely concerned” or “concerned” about the costs of health care in the U.S.
Based on their responses, those surveyed don’t think that the situation is going to improve anytime soon. When asked if they think that health care costs will increase, decrease or stay about the same in the next two years, 76 percent of respondents said that they think costs will increase. For those who choose to seek treatment and pay for it, the vast majority think that they’re overpaying, with 76 percent saying that they think Americans are paying too much for health care relative to the quality of the care. The survey results were based on responses from telephone interviews conducted this year between Jan. 14 and Feb. 20. Hank Sheinkopf of Sheinkopf Communications LIVE on LI in the AM w/ Jay Oliver! John Ray of Ray, Mitev & Associates, LLP LIVE on LI in the AM w/ Jay Oliver! New York State Assemblyman Fred Thiele LIVE on LI in the AM w/ Jay Oliver! Dia Dipasupil/Getty Images(NEW YORK) — Selma Blair recently shared a video documenting her struggles applying makeup due to multiple sclerosis (MS). In the clip, the 46-year-old actress, who was diagnosed with the chronic disease in August 2018, shows off her own type of “makeup tutorial” with impaired motor skills, using a healthy dose of humor. She received an outpouring of love and support from fans and friends alike after sharing the honest video. “OMG you are so funny! I love you so much Selma,” actress Debra Messing commented. “What a ROCKSTAR you are… I adore you… sending you tons of love today my girl,” Kris Jenner added. “You are so beautiful you don’t need make [up] but I agreew with big brush always. Love you. B,” Brooke Shields wrote. “What I love so much about you, is that as much change you have been through, you are still the same at [heart]!” a fan commented. Blair spoke about her MS diagnosis in a Good Morning America interview with Robin Roberts in February 2019. During the emotional interview, the actress was in an “exacerbation” of MS, or an attack that causes new symptoms or an increase of existing symptoms. She said that she was also suffering from spasmodic dysphonia, a neurological disorder affecting voice muscles in the larynx that reportedly affects 50,000 in the United States, according to the National Spasmodic Dysphonia Association. Blair said she is hopeful for the future and doctors have given her positive feedback about her prognosis. Samir Hussein/Samir Hussein/WireImage(LONDON) — Prince Harry and Meghan, the Duke and Duchess of Sussex, have already broken a record after launching their own Instagram account. The royal couple, who are expecting their first child, launched their @sussexroyal account Tuesday. It quickly broke a world record for the fastest time to gain one million followers on Instagram, according to Guinness World Records. Harry and Meghan’s account reached one million followers in five hours and 45 minutes, according to Guinness. The account now has more than two million followers. Their first post, which featured a series of photos, garnered more than 800,000 likes. Harry and Meghan formerly shared the Kensington Palace Instagram and Twitter accounts with Prince William and Kate, the Duke and Duchess of Cambridge. William and Kate will now keep the @KensingtonRoyal social media accounts. The social media split comes after William and Harry formally split their royal households. The palace announced in March that Meghan and Harry’s office will move to Buckingham Palace from Kensington Palace, where William and Kate’s office will remain. Harry and Meghan plan to move soon to Frogmore Cottage on the grounds of Windsor Estate, about 25 miles from London. The move means Harry and Meghan will no longer be neighbors to William, Kate and their three children, who live in Apartment 1A at Kensington Palace. Meghan and Harry’s staff will remain in London at Buckingham Palace and the couple will commute into the city for official events and meetings. Samir Hussein/Samir Hussein/WireImage(LONDON) — Prince Harry and Meghan, the Duke and Duchess of Sussex, have officially joined Instagram. The royal couple, who will celebrate their first wedding anniversary in May, launched their own account Tuesday. Harry and Meghan, who is pregnant with the couple’s first child, are expected to move soon to Frogmore Cottage on the grounds of Windsor Estate, about 25 miles from London. The move means Harry and Meghan will no longer be neighbors to William, Kate and their three children, who live in Apartment 1A at Kensington Palace. Centers for Disease Control and Prevention(ATLANTA) — The number of measles cases so far this year is more than all the cases reported in 2018, according to new data. The Centers for Disease Control reported Monday there had been 387 measles cases between Jan. 1 and March 28, 2019. By comparison, in all of 2018, there were 372 confirmed measles cases in the U.S. The first quarter of this year and all of last year are on the higher end for the past decade, though the year with the most cases came in 2014, when there were 667 cases over the course of the year, according to CDC data. The numbers of measles cases in 2014 and, now, 2019 are the highest since measles was eliminated in the United States in 2000. Vaccinations for measles and other contagious diseases like mumps have come under fire in recent years as individuals who decide not to get vaccinated or vaccinate their children — in the face of scientific evidence — are lowering local and national rates. Experts explain that the problem with some people opting out of vaccinations is that those lower numbers impact herd immunity, which refers to the protection of an entire community when immunity rates are sufficiently high. When this occurs, the likelihood of someone with a disease encountering someone non-immune is negligible, preventing the disease from spreading through the population. While much attention has been paid to outbreaks in Washington state and parts of New York, those are only two of the 15 states with confirmed cases this year. 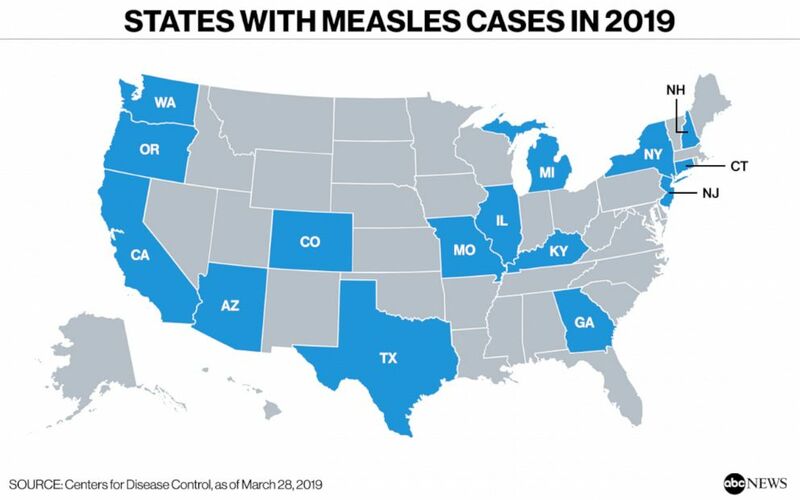 The other 13 states with cases of measles in the first three months of 2019 are Arizona, California, Colorado, Connecticut, Georgia, Illinois, Kentucky, Michigan, Missouri, New Hampshire, New Jersey, Oregon and Texas. Mlenny/iStock(NEW YORK) — “I’ll get an Uber” is a phrase said today by thousands of women, who see the ride-sharing service as a reliable way to get where they’re going. But after the murder of a University of South Carolina college student who police say was killed this weekend after getting into a car she mistakenly thought was an Uber, a new spotlight is being put on the safety of ride-sharing — especially for women. Samantha Josephson, 21, was alone when she requested an Uber ride early Friday morning, Columbia police said. After she got into a stranger’s car, mistaking it for her Uber, the child safely locks were activated, preventing her from escaping, police said. Her body was found in a wooded area near where suspect Nathaniel Rowland recently lived, police said. Rowland was arrested and charged with murder and kidnapping, said police. “Asking ‘WHAT’S MY NAME?’ must become as automatic for you as putting on a seatbelt in your own vehicle,” university president Harris Pastides wrote in the letter to students. Allan Bourdius, an Uber driver in Pittsburgh, Pa., says he often sees riders do the “wrong thing” when they approach his car. Bourdius said he normally drives Friday and Saturday nights and typically sees groups of women traveling together. When he does drive a female on her own, he said he only leaves after he sees her enter her destination. #Uber & #Lyft driver here. 1) Not blaming the victim. 2) Make sure the license plate matches your ride. 3) Don’t volunteer your name; make sure the driver knows your name. The safety practices for protecting against a fake ride-share driver apply to all people, of course, but are especially relevant for women in the light of Josephson’s death, and they apply to all ride-sharing services, from Uber to Lyft and Via. Uber also urges riders to check that the driver, car and license plate number match the information in the Uber app before getting in the car. If they do not match or you do not feel comfortable, do not get in the car. When you approach the car, before getting in, ask the driver both what his or her name is and what your name is to be sure you’re with the correct driver. For extra privacy, Uber suggests putting your pickup and/or drop-off destination as cross streets so your exact address is not revealed. You can also share your ride with friends and family via the app so they can follow your route and know your expected arrival time. 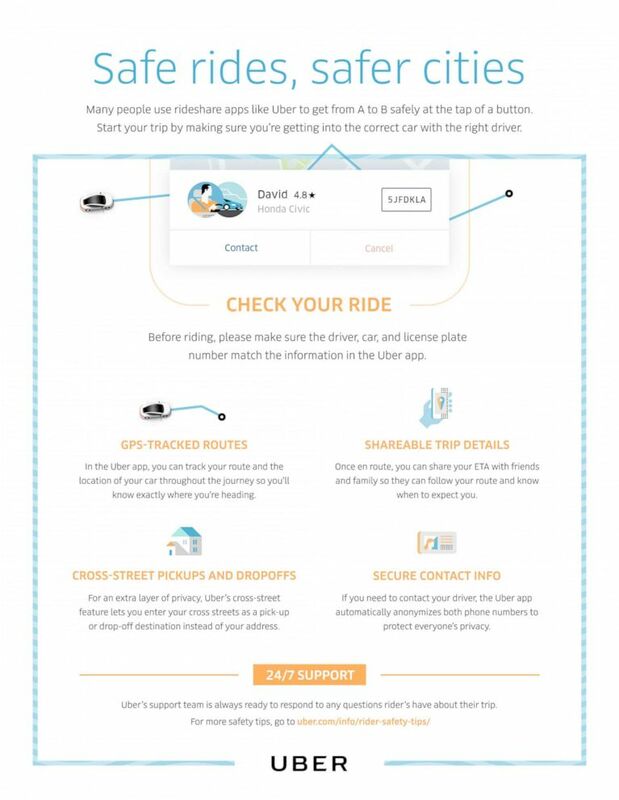 Another safety feature is that ride-sharing apps, Uber included, feature GPS-tracked routes so you can track your path during the ride and know where you are headed. Steve Gomez, security consultant and news contributor for ABC News, said he goes an extra step and loads the address of his destination into the GPS on his phone so he can watch the route the driver is taking. If there is a problem, the rider can question the driver, call 911 or just get out of the car. Another precaution recommended by Gomez is to screenshot the driver information and text it to a friend or relative. The Uber app also has some built-in safety features that riders can use to their advantage. During a ride, a black shield appears in the lower right screen of the app. Clicking on that shield takes you to a safety center with an emergency button to call 911. In some cities, new technology makes the car’s make and model, license plate and GPS location available to 911 dispatchers when that emergency button is used, according to Uber. That feature is available in more than 60 cities and counties across the U.S., with Uber planning to expand it to more. Uber’s Ride Check asks drivers and passengers about their status in unusual situations, like if there is a long stop during a trip. When waiting for your ride, Uber also has the Spotlight button on its app, which allows you to light up your phone and hold it towards your driver so that he or she knows you are the right person to pick up. The option appears on the app after you request the ride. Uber drivers can also choose to use a Beacon dashboard light that gives riders the option to choose the light they will see when the car arrives. Lyft also offers something similar, which they call Amp — a device that sits on the driver’s dashboard and syncs with the rider’s phone. Outside of ride-sharing apps, riders can use a personal safety app called SEAM. The app allows you to share your location, audio and photos with friends and family and make emergency calls from the app. The app is free and stores user data for up to 24 hours. A subscription ($5.99/month; $47.99/year) saves downloadable data for up to three months.